Old Jack Frost made a run at the Tomato Stand this weekend. Friday and Saturday night brought clear, windless skies and temperatures in the mid-30's. It wasn't all bad, frost covered lawns offered great photo ops and the mosquito population was decimated. 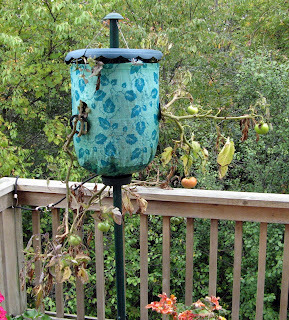 But the Tomato Tree Stand wasn't amused. The good news? Since the tomatoes were elevated 4 - 5 feet above the ground, they were spared a truly devastating attack. The bad news? Given the tenuous nature of the stand, I was limited in how aggressively I could cover the remaining fruit. By Monday morning there were only a few branches left. 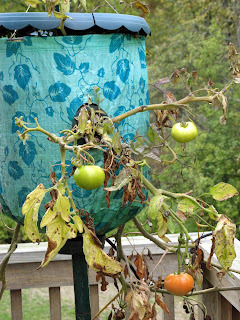 The 6 remaining tomatoes are hanging on, but just barely. There is one tomato that should ripen naturally and one other that will probably survive the brown bag approach. The others, well I'm trying not to concede, but all that's left is to hope for an extended bout of Indian summer. It's been very busy around here, I'll be back cooking for you in a couple of days. Your persistence with and dedication to this contraption are commendable. Had this graced my yard this summer, and failed as remarkably as it has, I would have wrenched the wretched thing out of existence. Thanks for doing a test-run for the rest of us, and thanks for writing about it. It's always good reading. All in all, I would rather have ketchup.